Your garden wedding decoration need not be expensive when there is so much natural beauty. Outdoor weddings are becoming a popular cheaper option for couples as wedding venues can be so expensive. The best bit is there is nothing more natural than a garden wedding where the beauty of flowers, trees, and the sky and mother earth set the stage for your garden wedding. 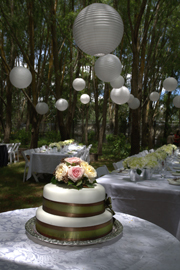 It is best to time your garden wedding day when it is actually feasible to hold it outdoors. Though it is possible to have a garden wedding in the dead of winter, it will be quite expensive when you consider having to keep your guests warm with a wedding tent and outdoor heaters. Summer is the best time to hold a garden wedding and if you are set on having one, it is best to set the ball rolling as early as possible. Choose a garden venue that is not so big. The blooming flowers and shady trees of the venue are part of the garden wedding decoration. You will save a ton in your garden wedding decoration by maximizing the natural plants and flowers in the area. It is best to set a garden wedding as the sun goes down so you can take the opportunity for a magical light play. Use paper lanterns with miniature lights and hang them on trees. Choose the paper lanterns that will match your color motif. A more formal wedding garden will bode well with a neutral or one-color paper lantern. If you choose, white, then white it should be. If you want a more playful and fun lighting, then opt for different colored-paper lanterns. You can also choose to use strings of tiny lights and set them up on trees and plants, arbors and gazebos. There are tiny lights in the shape of butterflies, dragonflies and birds. These lights are fairly cheap. Buy some and use them to decorate the garden. If there are fountains in the garden, make sure that floating candles and flowers are part of the fountain. Lanterns also look good during the day and having strings of paper lanterns across the area that you want to use for your reception looks great. Or you could hang lanterns in the trees and on bushes. 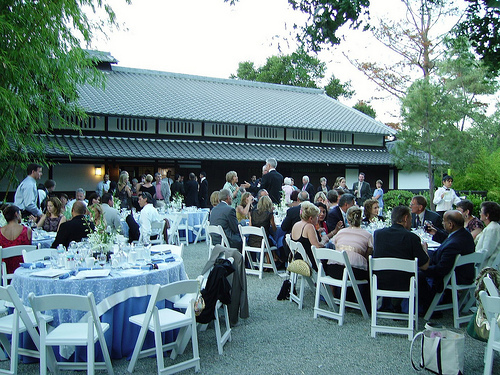 The sights and sounds of a garden is an important factor during a garden wedding. How would you feel if in the middle of the wedding vow, a large freight truck passes by and honks? It would be nice to if you can afford a string quartet to play during the wedding but if there's no budget for that, a good old CD player with the right kind of CDs to play would do fine. Another great sound is that of chimes. There are varied types of chimes which are available everywhere. Why not buy a few pieces and hang them strategically all around the venue? As evening comes and the light play comes into effect, the wonderful sound of different pitched chimes as a breeze wafts by would just make the moment perfect. 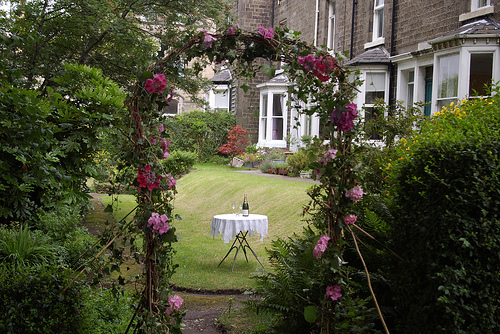 Garden weddings have arbors or arches or gazebos. It is up to you how you want to go about decorating such structures. However, for a garden wedding, it follows that the theme should be in synch with nature so it is best to decorate arbor or arches or gazebos with foliage. Lay a base of leaves on the arch for the flowers to be attached on. Swag garlands of ivy and string lights on the gazebo. An arbor is a decorative piece by itself but you can make it more interesting by hanging tulles like curtains and then tying them on the post with a garland of flowers. Do not forget to add strings of mini lights that could either trace the silhouette of the structure or hung in varied lengths. For the aisles, buy buckets of loose petals from a flower shop. Lay them out instead of a carpet for the aisles. Scallop garlands on the chairs that line up the aisles. You can add points of interest by swirling ribbons on the garlands. Not everyone is going to have a beautiful garden to host their wedding and if that is you don't panic. One of the cheapest ways to hide ugly or plain walls and fence is to have a screen. You would do this quite naturally indoors and it is no harder outside. Find yourself some funky material or one that fits with your theme and then hang it either using a washing line or string up a curtain wire. Make sure it is secure and will withstand people walking through it and children playing and hiding in it! You can also use this as your backdrop to photographs of you and your guests, it will be like having your own outdoor studio!